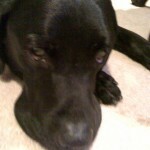 I have a clean doggie! 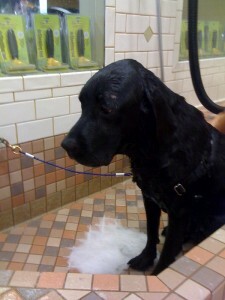 I went to Woodland’s Pet Food & Treats and rented a bathtub (also known as a Pet Wash Center) for Poncho. He is now very clean and fluffy (and smells good). The dog bathtub rentals are run similar to a do-it-yourself car wash. First you enter the fancy store filled with dog toys, dog food, and homemade dog cookies that look like human cookies, then you go to the counter and pay $15 for a dog bath. (Yes his bath cost more than my haircut but this is Marin where even the dogs feel entitled.) You then lead your dog up the steps in to the tub, clip him in with cables that are attached to the tub walls, put your token in the machine and begin the wash cycle. First you rinse your dog, then move the knob to shampoo/conditioning cycle, then rinse again, and rinse some more to make sure you get all the soap off. Then use the blower to blow him dry. Meanwhile your dog looks at you like he hates you but in the end he comes out happy, fluffy, smelling and looking good. Afterwards you walk through the fancy dog store trying to explain to your dog that all the toys and snacks on the shelf are not actually his. 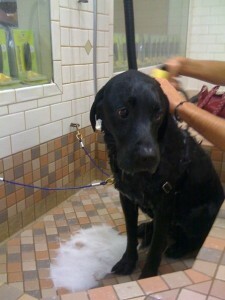 Anyway, washing your dog on a Sunday afternoon at Woodland’s is a fun family activity for everyone but your dog. Poncho is very good at expressing his feelings. I tried to take his picture after the bath to show you how clean he is but I think he is still mad at me. He refused to get up. ← Affordable Haircuts in Marin? Yes. IMHO any contact is good, unless you’re deliberately hurting. My birds hate having their feathers hand-preened, but they do their best to give a light nip as opposed to letting me have it for some greater transgression. I believe although they dislike the preening, they can sense good intent. What a hard life Poncho has! Being sad because he is getting a warm nice shower with shampoo and conditioner, a massage, gets dry so it doesn’t catch a cold… You should bathe him like a dog: outside under the rain and hose him with cold water!